We remember who came before us and what they did and where they lived. We respect our past, and we preserve it. In Corolla, a woman gives the town its own schoolhouse again. Editor’s Note: This story was originally published in October 2012. When a construction crew began tearing out the walls of the old Corolla schoolhouse in 1999, they didn’t expect to find anything behind the boards. But tucked inside those walls were valentines, notes, and pencils gnawed right down to their erasers. The notepaper was nearly translucent, but the markings were still visible. Sometime, maybe 50 years ago, maybe 100 years ago, a little boy or little girl sat at a desk inside this schoolhouse and divided 88 by 9. Some little girl gave some sweet-faced boy a valentine, probably clutching it to her chest before slipping it inside his cubby. Sharon Twiddy didn’t plan to move to Corolla, and she didn’t plan to restore buildings and own real estate. She grew up in Winston-Salem and went to college in Greensboro, where she met her husband, Doug. Doug always spent his summers on the Outer Banks, and he convinced her 35 years ago that life near the water would be a better life. In the ’80s, Doug found an old life saving station in Kill Devil Hills that once housed surfmen who patrolled the beach looking for shipwrecks. Every time he asked the owner if he could buy the building, the owner just said, “Not now.” Doug gave the man his card, and eventually, the man called. The Twiddys moved the building to Corolla and spent about two years restoring it. It was their first time restoring anything, and 26 years later, they’ve helped restore eight other buildings. Finding what’s inside those walls, like those valentines and pencils, and learning the story of the building are the best parts of it all, Sharon Twiddy says. Twiddy soon learned the history of the buildings. The Parker House didn’t have the regular two-by-fours you see in today’s structures. There were boards of all different sizes and types. Twiddy figures the families on the Outer Banks in the early 20th century didn’t have access to hardware stores, so they used what wood they found on the shores to build their homes. In the Lewark-Gray house, Twiddy noticed the steep roof, which is uncharacteristic for homes on the Outer Banks. The owner probably lived in a colder climate, bought the house plan farther north, then built the house in Corolla. In 1999, Twiddy bought the schoolhouse. The construction crews went to work, and soon, they found the pencils and valentines. For years, Twiddy kept an exhibition on local wild horses inside the school. In 2011, she started thinking. What if the school became a school again? The walls are a pale, baby yellow. Bright, plastic boxes line a bookshelf. The boxes are labeled science fiction, poetry, parts of speech, Eyewitness Books. At times, you know this place surely smells like glue and construction paper and sticky hands and milky breath. On August 28, school started. 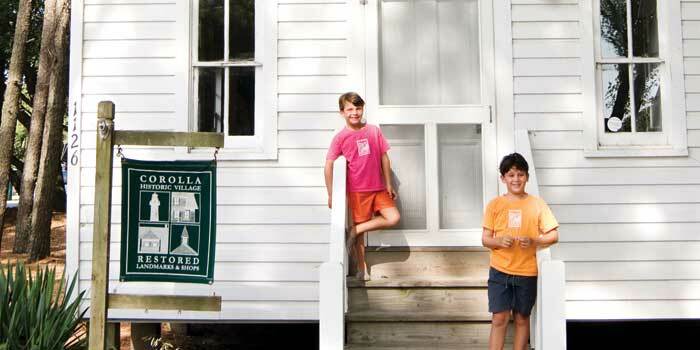 Corolla Village has its first public schoolhouse since 1958, and it’s in the same building. The village hired two teachers, and the kids are enrolled in kindergarten through sixth grade. In February, they’ll make valentines for each other. They’ll chew down their pencils to the erasers, and they’ll press hard on their paper when they divide. And maybe 50 or 100 years from now, some other construction crew will find a note that some little boy or girl slipped inside the wall. Sarah Perry is an associate editor at Our State. Find more of her archived stories here.